To reduce use of chemical fertiliser and synthetic pesticides to make the soil healthy and produce safe food. To promote the concept of Sustainable agriculture through Organic cultivation. Awareness creation among the farmers side by side training to farmers on preparation and use of Organic manures in their crops. Linkage with Govt. departments in promotion of Govt. Schemes and advocacy for Small and marginal farmers to get the benefit of Govt. Schemes. We do this through Awareness generation, Mass meetings, trainings and establishment of community Institutions. Small and Marginal Farmers are our target groups. We covered 10 villages, 08 G.P.S, 03 Blocks of Ganjam district for this project. Enhancing farmers’ adaptation capacity to mitigate effect of Climate Change. Climate change effect is well realised by the poorer section of society particularly those who depend on nature and natural resources. So the project aims to experiment systematically local practices blending with scientific input and establish systems to meet the challenge of climate change in participation with the farmers. To Develop the Skill and capacity of Vulnerable groups particularly small and marginal farmers in flooding, water stagnant and drought prone regions to adapt the effect of climate change. Area selection and vulnerable group identification, skill and capacity development, input support for taking up better farming practice and farm and non-farm alternative livelihood activities. 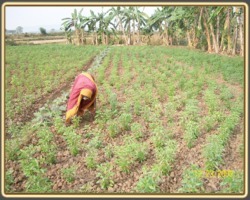 The target groups are small and marginal farmers, landless agriculture labourers. Skill and capacity development, input support for alternative livelihood of vulnerable groups. Community Tank Development and Management. Building skill and capacity of Pani Panchayat (tank water user farmers committee) for Renovation of Minor Irrigation Tanks and providing them input to manage their irrigation for effective water use and to check loss of water. Enhancing irrigation potential of the tank to enable users to produce at least two crops in a year. Renovation of Minor irrigation Tanks for sustainable Livelihood. 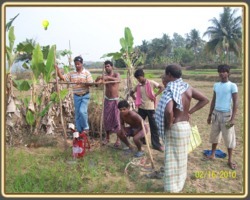 We give Awareness generation among the Tank users and community Participation for sustainable livelihood development. Linking farmers and dependant families of command area with different govt. schemes and program. The target groups are the families living with in command area of the Tank. 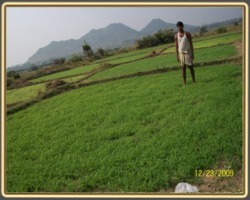 We covered	09 villages, 03 G.Ps, 02 Blocks of Ganjam district for this project. Broad activities are Mass meetings, trainings, input supports for alternative livelihood. Coordination and linkage with different govt department to make the program objective realised. It is a joint program of department of water resources and UAA.